My kids were so excited that I was selected to check out Ruby’s Rockets Frozen Fruit and Vegetable Pops this summer. We were sent 3 different flavors to try–Orbit Orange, Rock-It-Red, and Galaxy Green. Ruby Rockets are an awesome healthy snack alternative for your kids. They are the perfect summer treat or snack after a super afternoon out on the soccer field. 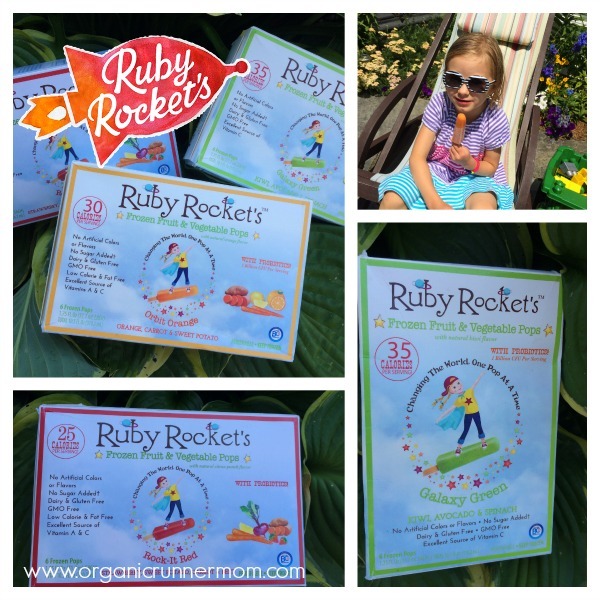 As a mom I love Ruby’ Rocket’s because they are a sweet healthy snacking alternative. Inspired by home blended juices and an on air t.v. hosts reference to “a glass of fresh,” founder Wendy began creating juice smoothies for her child. After that a smoothie spill and the re-discovery of popsicle molds led to the creation of Ruby Rockets! I love the unique combinations of flavors. My favorite is the Galaxy Green. I have always loved spinach in my smoothies and these popsicles are no different. Organic Runner Boy loves the Rock-it Red which are sweet with a little hint of tartness from the lemon. Organic Runner girl enjoys the Orbit Orange as she is the carrot lover in the family. Ruby Rockets are currently offered in stores such as Roche Brothers and Wegmans on the East Coast but can also be purchased online. My Ruby Rockets Fruit and Veggie Pops arrived perfectly frozen and ready to enjoy! Have you ever tried Ruby Rockets Fruit and Vegetable Pops? If not you should check out their website to find out more about this cool naturally sweet treat! Do you make your own popsicles? The included bacteria is a definite bonus! I’ve never heard of them but they sound delish! Angela, I am not sure if they are here in NH yet but you can order online plus I got some great new flavor ideas for making our own! My 4 yo is obsessed with popsicles- we’ll have to check these out! Popsicles are a hit with my kids too! Nothing better than a popsicle on a hot day! CARLA recently posted…I am anxious. They are definitely a great alternative to making your own and the flavor combos gave me some great new ideas!